Have you ever looked closely at and read everything on the label of the prescription medication you picked up from the pharmacy? Don’t feel bad. You aren’t alone. Most patients probably glance at the drug name and directions…and hardly notice anything else. But you might be surprised at just HOW MUCH information is actually contained on that little label if you took some time to check it out. In fact, some of the information it contains could save you a lot of frustration, when used appropriately. In this post I am going to take you on a guided tour of that prescription label which is just sitting there wrapped around your bottle of prescription tablets, capsules or cream. Please make yourself cozy. Grab a beverage. Keep your limbs inside the vehicle at all times. We’re about to launch off onto a little trip into label-land. Before we even begin, please notice that your prescription does, in fact, have a label. This isn’t just a pharmaceutical courtesy. The law (both Federal and state law) require that all prescriptions dispensed be appropriately labeled. While Federal laws pertaining to prescription drug labeling apply equally to all states, your specific state may also have additional requirements which we will discuss as well. But this post is not about the nuances of pharmacy law and how they relate to the drug label. This is a tour of label-town. So let’s begin. Your name should be on the prescription label. Always check this. Be sure the spelling is correct. The label will also likely have your address, though this isn’t specifically required by Federal law. For example, the label might read: “#30 tab Lisinopril 10mg” which would mean you are supposed to have gotten 30 tablets of lisinopril 10mg. Sometimes the drug name will be abbreviated. Drug names can be long, and as such don’t always fit easily onto the drug label. Therefore, if you want to be sure about the full-name of the drug, you might need to look on the pamphlet that comes with the prescription. Some states will require additional, unique drug-related information. For example, Massachusetts (and other states too) requires the name of the brand-name product to be on the label, as well as the generic name, when a generic is substituted for the brand. In Connecticut, the law requires the name of the drug manufacturer when a generic is dispensed. Other states may require or allow this also, in which case you might see a few letters or the full name of the actual drug manufacturer like “Mylan” or “Teva.” This might be preceded by “Mfr:” meaning, manufacturer. Finally some prescription labels will go so far as to provide a little image of the pill itself or a description of what the tablet or capsule should look like. Use this information as a way to ensure you have received the correct medication in your bottle. Read the directions carefully, even if you think you remember how the doctor or pharmacist told you to take it. If there is ever a question about what it says on your prescription label and how you think you were told to take it, call your pharmacy before taking the medication. Your doctor’s name should be on the prescription label. Checking this is a good practice. If the doctor’s name was entered incorrectly, and your prescription needs to be refilled, the pharmacy may end up contacting the wrong prescriber. But also understand that your prescription may have actually been ordered by someone other than your normal doctor. This is very common for prescriptions written for patients being discharged from the hospital or when your doctor is part of a large practice with other physicians who might order your medication as well. The pharmacy where you obtained the prescription, along with their contact information, should be on the prescription label. Sometimes the pharmacy will also include their store number – so if you see a series of 4-5 numbers after the pharmacy name (or sometimes after the Rx#), this may be the store number of the pharmacy. Prescription Number: Every prescription must be assigned a number, known as a serial number, but usually referred to as a “prescription number” or “Rx number.” This number is automatically generated by the pharmacy every time a new prescription is ordered. In a pharmacy, prescriptions are filed numerically. The prescription number should usually be in big, bold print on your label. This is the number you will typically use when you call the pharmacy to order refills of your prescription. When you run out of refills and your prescriber issues a new prescription, that prescription will have a new number. Note, some pharmacies may use an extension on that Rx# to indicate which fill # you are getting. For example, the first time you fill the prescription it might read RX#88443027-00 and then when you get your first refill it might read RX#88443027-01. Not all pharmacies do this. 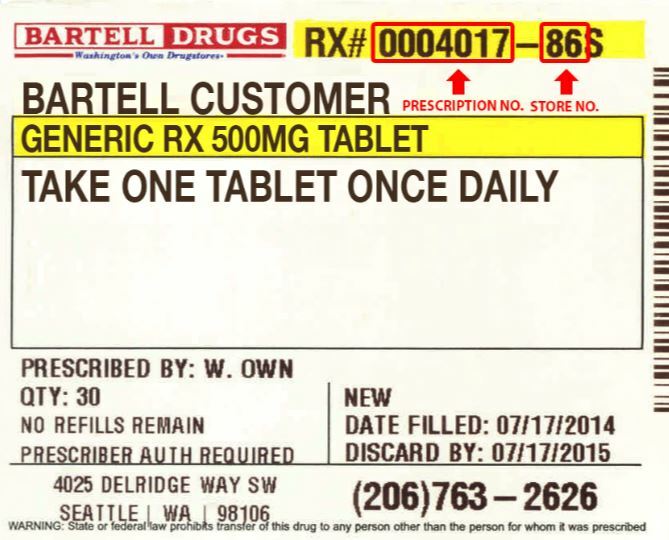 Prescription Refills: The prescription label must indicate how many refills you have remaining. This is important and should be checked by the patient. Be sure if your prescription says “zero refills” that you give plenty of time (several days usually) for the pharmacy to contact the physician office on your behalf to get this renewed. Note: It will not take several days for us to contact your doctor. It will take less than 15 seconds. But it may take several days (or longer) for your doctor to reply. Fill Date: This is the date you actually filled the prescription on. Note, this is not necessarily the date you picked up the medication. It is the date the pharmacy processed it on. And when the pharmacy is calculating how many days the medication should last, they are using the date they filled it on to do this. Drug Expiration Date: The product in the bottle, or the cream, patches or inhaled powder…whatever it is…will have an expiration date. This is the date, beyond which, the pharmacy no longer can assure you the medication is safe to use. Get rid of it after this date. The drug expiration date may be worded in several ways, such as “do not use beyond _____” or “exp _____” or “use before ______.” Ordinarily this will be 1 year from the date it was dispensed, but it may be less than that if the medication itself has a shorter shelf-life. Prescription Expiration Date: This is the date, beyond which you can no longer refill this prescription. For example, many states consider a prescription to be invalid 1 year after the date it was written. Therefore, even if you technically have several refills remaining, those refills become void after this date. On a prescription label this information is usually written after the refill information. For example, “may be refilled 5 times before ______(date).” After that date, it can no longer be filled. In the case of controlled substances, Federal law does not allow them to be filled or refilled beyond 6 months from the date which the prescriber wrote the prescription order. Pharmacist/Tech Initials: The initials of the pharmacist, and maybe even the full pharmacist name, may appear on the label. Do you see 2 or 3 letters like “SP” or “MRC” typed on the label somewhere? Those could be the initials of the pharmacist responsible for filling your prescription. Some pharmacies also include the initials of the technician involved in filling your prescription as well. Safety cap preference: Have you been asked if you prefer non-child proof caps on your bottles? Child safety caps are Federally required on all prescription products, but a patient may request that their medication be dispensed in more easy-to-open bottles. Your preference might be indicated in some way on the label. For example, you might see “NSC” meaning “no safety caps.” Other pharmacies have a more subtle code for indicating when non-safety caps should be used, like an “*” appearing somewhere on the label. Bar code: Your label may have a bar code. This bar code indicates that the pharmacy utilizes technology to scan your label and cross check it by scanning the bar code on the prescription stock-bottle or package, to be sure that they match. This is an important safety feature and helps ensure you get the right product every time. ©Jason Poquette and The Honest Apothecary. Unauthorized use and/or duplication of this material without express and written permission from this blog’s author and/or owner is strictly prohibited. Excerpts and links may be used, provided that full and clear credit is given to Jason Poquette and The Honest Apothecary with appropriate and specific links to the original content.